I like to think that most people would yield to a duck if it was safe to do so. But what if the duck was six-foot-four? The answer is apparently no. 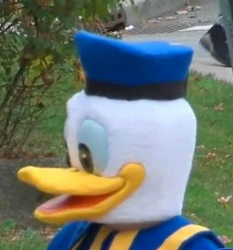 This duck was, in fact, an undercover officer dressed in a Donald Duck costume (and so arguably not "undercover" at all). He was part of an operation in Fort Lee, New Jersey, intended to encourage drivers to yield to pedestrians. According to Chief Kenneth Bendul, 102 pedestrians have been hit by cars in Fort Lee during the past two years, and he hopes the Pedestrians in the Crosswalk safety program will bring those numbers down. In this iteration of the program, officers (and a news crew) monitored the crosswalk while the officer dressed as Duck tried to cross the street. If a driver failed to yield to Duck, other officers signaled that driver to pull over and awarded him or her a $230 ticket. 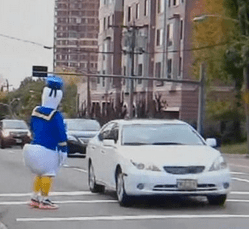 Well over 100 drivers were ticketed; as the video shows, many drove by without slowing though Duck was either about to cross or was actually in the intersection. 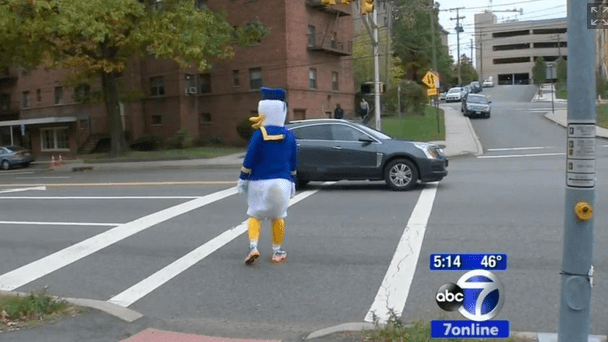 The use of a duck costume has caused some controversy, although it would appear to be a good way to eliminate arguments that the driver did not see the pedestrian. Also, the operation took place on Halloween. Actually, the controversy may be primarily in the mind of one driver, who told ABC News that she thought the practice was unfair and that she plans to fight the citation. "This duck kept going on the curb, off the curb," the driver said. "I thought it was some crazy guy on Halloween." Since there is no specific crazy-guy-on-Halloween exception for the rule about yielding to pedestrians, the driver then clarified that she feared for her safety. "They told me that I was getting a ticket because I didn't stop for a pedestrian," she said. "And it was a crazy— it was a duck, it was a huge duck. It was scary. I'm a woman, it scared me." Based on the video she appeared to be entirely serious about this. The argument is apparently that she was afraid to stop for the huge duck because there might be a huge man inside the huge duck who might try to assault her. But she doesn't seem to have thought this all the way through before presenting it to the world. First, although the duck was said to be about 6'4", it was clearly wearing a sizeable hat. I would estimate the hat to be at least five inches tall, which would make the hypothetical man inside no more than average height. Second, if he did try to attack the car, locking the doors, driving away and/or hitting him with the car would all seem to be effective countermeasures. Third, if there were a struggle, the assailant would be hampered by the large duck head, and in any event the operation was carried out in broad daylight on a busy street so that hopefully other drivers, or perhaps the news crew standing there filming the whole thing, would be able to help. All told, the huge duck does not seem to have presented a huge risk. Even to a woman, which the woman emphasized that she was. But in addition to the duck's alleged hugeness, she also pointed to the mere fact of the costume, which seems to undermine her whole argument. "It scared me," she said again. "It was a huge duck. If it was a normal person, or even a cop dressed as a normal person, I think all those people would have stopped." Well, to be fair, maybe she was just worried because he wasn't wearing pants. Chief Bendul took the opportunity to drive home the ultimate message: "When you see a pedestrian, whether it's a young child, whether it's an adult, even if it's a seven-foot duck—stop, let the pedestrian cross safely, and then proceed with your day." Wise words. Via Tom Harrison's "Headline of the Day" email list, which you can join by emailing him at tom.harrison @lawyersweekly.com.